Having grown up with the Canadian Yogen Früz chain, we’ve been enjoying frozen yogurt for years now. Most recently, we tasted some pretty decent fro-yo at Yogurtime SoHo (click here), in Hong Kong. Prior to that, we experienced our very first Pinkberry in San Diego, California: Read our review here. 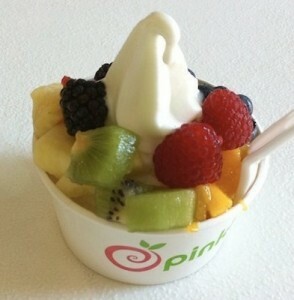 Back in 2005, celebrities like Paris Hilton were raving about their “Crackberry” adoration for Pinkberry. A year later we were in Seoul enjoying South Korea’s über popular Red Mango (read our experience here) frozen yogurt. I remember thinking the company seemed like a copycat of the famous American Pinkberry craze. In reality, Pinkberry, founded in 2005 by Korean-Americans in California, is the real copycat in this dessert game: Red Mango’s first location opened in Seoul in 2003. Sorry Pinkberry, Red Mango’s got two years on ya! Some people protest that both chains are actually knockoffs of Iceberry, a South Korean *patbingsu chain. Holy fro-yo wars! *What is patbingsu you ask? Patbingsu is a Korean dessert, originally consisting of shaved ice + sweetened beans. Nowadays, this contemporary dessert is topped with frozen yogurt, sweetened condensed milk, syrups, chewy jellies, cereal flakes and a variety of fruit. Traditional patbingsu is similar to other Asian shaved-ice & fruit and/or bean desserts: like Cendol, a drink found around South East Asia, ABC (Air Batu Campur)/ Ais Kacang in Malaysia and Singapore, Es Teler in Indonesia, Halo-Halo in the Philippines, Nam Kang Sai in Thailand, and Sâm bổ lượng in Vietnam – just to name a few. Back to frozen yogurt specifically. Now that I’ve had Red Mango in Seattle and various locations in Seoul, and now finally Pinkberry in San Diego, I can tell you which one I like better. Red Mango in Seoul wins hands down. Surprising perhaps, since I recently wrote a post about certain Asian cuisines tasting better in Vancouver. An interesting thing about South Korea is that they have the best tasting fast food, out of any country I’ve traveled. For real. McDonald’s, Krispy Kreme, Coca-Cola, and yes even Red Mango are far superior in the ROK. Pinkberry may be the crackberry of SoCal, but fast food is the crack of Seoul. Personally, I think Coke tastes better in South Korea than any other country I’ve drank Coca-Cola in, and let me tell you I’ve had Coke in a lot of countries – the beverage, not the crack 😉 (The UAE had probably my least favorite Coke because it was a tad watery and tasted ‘tinny’. Fiji Coke was up there with South Korea in terms of quality because it was sold in glass bottles and tasted so refreshing under the hot South Pacific sun). Any Coke/fast food/frozen yogurt connoisseurs out there who can attest to my findings?! Now that Iceberry, Red Mango, and Pinkberry are all well established in both the USA and South Korea, who do you think is the original victor in this fro-yo war? Celebrate The Royal Wedding London-Style — In Vancouver!